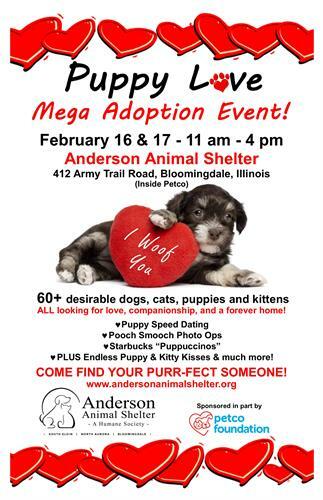 Wagging tails, wet noses and unconditional love are waiting for you at Anderson Animal Shelter’s Mega “Puppy Love” Adoption Event hosted at the Petco in Bloomingdale, (412 West Army Trail Road) from 11 am to 4 pm, Saturday, February 16th and Sunday, February 17th! There’s someone for everyone, in all sizes and shapes, and very eager to meet you. More than 60 adoptable dogs, cats, puppies and kittens, all looking for a forever home, are ready to meet your family during this Valentine’s season. Looking for a little love? A devoted friend? If you enjoy long walks in the park, belly rubs, cuddles on the couch, and endless sloppy kisses, then we have the purr-fect someone for you!!! Anderson Animal Shelter is the Fox Valley area’s largest and oldest animal shelter, having served the area for more than 50 years. All of our adoptable companions are spayed or neutered, up-to-date on vaccinations, dewormed, microchipped, and include a free vet exam from a participating clinic and one month of free pet health insurance! This life-saving event is made possible through a special partnership with the Petco Foundation. Our Mega “Puppy Love” Adoption Event will feature “Puppy Speed Dating” (A fast-paced match up to find the next love of your life), a “Pooch Smooch” photo op, complimentry Starbucks “Puppuccino’s”, plus wiggles, and waggles, and kisses galore! Don’t stay lonely and unloved any longer, come to Anderson Animal Shelter’s Mega “Puppy Love” Adoption Event at Petco in Bloomingdale, from 11 am to 4 pm, Saturday, February 16th and Sunday, Februry 17th! Cupid says “A pet is the only thing that loves you more than you love yourself.” Visit www.andersonanimalshelter.org for more information and our current listing of adoptables.